How To Choose the Perfect Powerbank? For people who are on the move constantly, power banks are an important accessory to have in their gadget kitty. If you’re traveling and you are away from a power source, a dedicated battery pack comes in handy to juice up your smartphone, laptop, camera, and other electronic gadgets. But before you purchase a power bank you need to know certain important things. The things that will make or break your buying decision. These buying tips will enhance your purchase experience to a different level and will help you choose the best power bank. So without any further ado, let’s look at the top X things to consider before buying a power bank. Though it is not the be all and end all, when buying a power bank the first factor to look for is the advertised battery capacity. Confused? Let me explain. Power banks capacity varies from product to product depending on the number of cells in the power bank. It may start from as low as 2,000 mAh to as high as 30,000 mAh. Based on your use case, you have to choose the desired battery capacity. If you just need a pocket-sized power bank to juice up your smartphone or smartwatch once, a smaller capacity battery pack will be enough. But if you are traveling a lot and you need to charge your laptop (Laptop should have USB-C port) and smartphone at least twice, a bigger battery capacity is advised. Ideally, a power bank having battery capacity between 10,000 and 20,000 mAh will be perfect for most people. The power input and output of the power bank is also very important. A higher power output means that your device will charge at a faster speed and higher input power increases the charging speed of power bank itself. Normally the power output found in battery packs is either up to 12 Watts (5V, 2.4A or 5V, 2.1 A, Normal charging) or 18 Watts (9 V, 2 A, Fast charging). For faster charging of your device, an output port having 9V, 2A rating is advised. A higher input power means that the power bank can quickly charge itself up when it is plugged to a power source. Here also check for a 9V, 2A rated input port. One of the reasons why I said advertised battery capacity is not the be all and end all is because of conversion rate and effective battery output. Even though a power bank may have an advertised battery capacity of 10,000 mAh, you must have noticed that you were not able to charge your 3,000 mAh smartphone battery even thrice. This is where the concept of conversion rate and effective battery capacity comes into the picture. Batteries inside the power banks are usually rated at 3.7V. The battery capacity listed by the manufacturer will be based on this rating. That is, if it is supplying power at 3.7V to a device it will be having the advertised battery capacity. But the USB output from the power bank is rated at 5V or 9V. The actual capacity of the power bank will be based on this rating. There is an equation as well to calculate the actual battery capacity. There is also a problem of power loss in transmission and power leak over a period of time from the power bank. That’s where conversion rate comes into the picture. Let’s clarify your confusion through an example. Suppose a manufacturer sells a power bank with an advertised capacity of 10,000 mAh and conversion rate of 90 % (this is advertised by some brands, but some brands don’t reveal this number). The actual capacity of that power bank if the power is supplied to a smartphone via 5V output port will be ( 3.7 x 10000 /5 ) = 7400 mAh. With the conversion rate of 90%, the effective battery output will be ( 90% of 7400 mAh) = 6660 mAh. That’s 66% of the advertised battery capacity! Quite a letdown, isn’t it? The bigger and better brands have found a workaround to provide the maximum effective output at faster-charging speed through the innovative implementation of fast charging technologies. In any case, look at user reviews and expert recommendations on power bank before you buy them so that you don’t get fooled by the battery capacity advertised. Some power bank has only 1 output port under 15W (5V, 2.1A or 5V, 2.4A) and some have 2 or 3 ports at 12W or 18W (9V, 2A or 6V, 1.5A). So before buying your power bank make sure that it has enough output ports satisfying your needs. I would prefer at least 2 output ports. Most of the power banks in India has only micro USB input ports available. As the industry is moving towards USB Type C ports, it is future proof to go for a power bank having USB-C port for power input and output. Safety, design and build quality of power banks are also an important aspect in enhancing the user experience of a power bank. As batteries are flammable objects and there is a chance of explosion, it is important that battery packs like power banks have followed a rigorous safety standard. Notable brands have different layers of circuit protection to mitigate the risks. In short, safety should be an important factor in your buying decision. When it comes to the design aspects, no one wants to buy an ugly looking power bank. As you will be using it on the go for charging, a good design for your power bank add an extra layer beauty into it and compels you to take it along in your journey. Make sure the design of the power bank is suitable to fit into your pocket or backpack. Good design enhances the overall experience of handling a power bank. 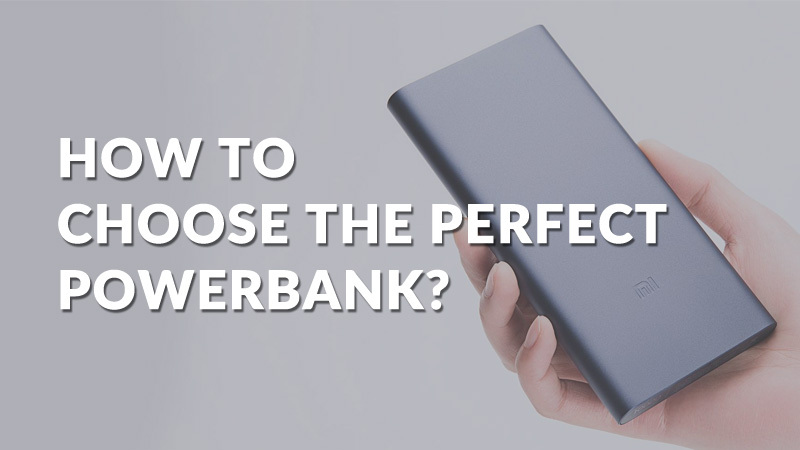 The power bank should have a clearly visible battery level indicator to calculate the leftover battery. It should have a simple power button and other control buttons as well. Another key aspect to check is whether the battery cells are Lithium-ion or Lithium Polymer. According to Android Authority writer Matthew Sabatini, Lithium-ion battery and Lithium-Polymer battery do not differ much in performance. But Lithium-Polymer batteries are very lightweight and have improved safety. So they are more durable against overheating and overcharging. The sole purpose of buying a power bank is to charge your device when you are traveling or when you’re away from a charging point for some time. Hence portability of your power bank is paramount. An ideal power bank should be lightweight. If you need a higher battery capacity, the weight can be a little bigger, but for a 10-20,000 mAh power bank, the ideal weight is just around 200 gram. A bulky power bank will be difficult to carry on the go in your backpack or pocket. It should fit nicely in your hand as well. Power banks have become an unavoidable gadget in our everyday life. With shrinking smartphone battery life and increased use of different gadgets, we need a constant power supply even when we are on the go. That’s where power banks come into the picture. A good power bank should have adequate battery capacity, both in paper and in reality. It should also have fast charging features to quickly juice up our device when we are on the go. The number of ports, portability, safety and build quality are all important to decide the best power bank for you. We hope this article must have cleared all your doubts you had before buying a power bank. Whether yes or no, we will be glad to hear your feedback. With that, let’s wind up this buying guide on power banks. Visit https://bettershark.com for the list of best gadgets you can buy.